Only 452 pieces in stock! A refreshing, antioxidant-filled facial mist that helps clear congested skin, evens skin tone, and protects skin from damaging environmental stress. This is your congestion clearing, dullness ditching, vibrant skin pick-me-up. All the goodness of antioxidant-rich Vitamin C, thyme, neroli, and willow bark extract work together to stimulate cell turnover and fight off bad bacteria that can cause acne breakouts. Green tea also does some free-radical fighting, while aloe vera cools and soothes, reducing redness and inflammation. Niacinamide enhance skin’s elasticity and barrier function to improve the tone and texture. The result? A clear, healthy, radiant complexion. Neroli (orange blossom) Water// Neroli is the flower of the bitter orange tree. A beautifully fragrant flower, neroli’s amazing aroma has been shown to uplift one’s mood and reduce anxiety. This floral water is hydrating, antibacterial, and contains antioxidants to help reduce the signs of aging. Rock Rose Hydrosol // A floral water with amazing skin healing, scar fading, anti-inflammatory, and anti-aging properties. Rock rose is high in antioxidants that protect skin, neutralize and strengthen skin’s defense against free radicals. Immortelle Hydrosol // Helichrysum, also known as immortelle or everlasting, is a small yellow flower that can help heal and regenerate damaged skin. It gets its name from the fact that the blooms never wilt! As a hydrosol, immortelle works as an astringent, a skin tonic, an anti-inflammatory, and can improve circulation. Vitamin C // We use a stable and effective water-soluble form of vitamin C (sodium ascorbyl phosphate) in this toner. Vitamin C is a potent antioxidant that can help improve elasticity by promoting collagen production, prevent breakouts, clarify a complexion, fade discoloration and reduce inflammation. Our Vitamin C is vegan. Green Tea // Green tea is full of antioxidant and anti-inflammatory properties that can help reduce sebum production and help fight off free radicals that cause skin damage. It can also help calm down irritated, sensitive and breakout prone skin. 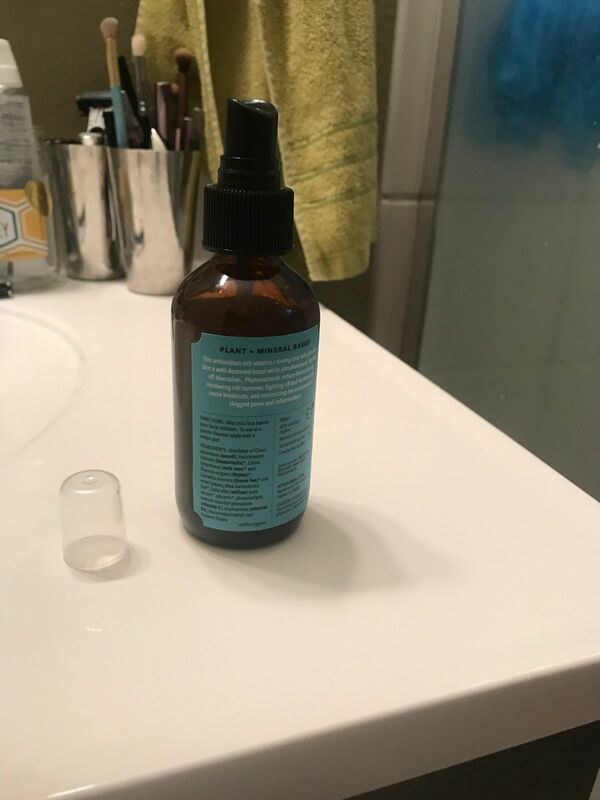 Although it can be used any time of day for a spirit lift with skincare benefits, this natural toner for face is best applied right after cleansing. Mist onto face or apply with a cotton pad. You can even mix a few pumps in your palm with your favorite facial oil or serum before applying. Inhale the deep floral aroma of orange blossom, immortelle blooms and rock rose water to calm the nerves and uplift your spirit, whenever needed. Pro tip: We recommend using this toner (or our Rose Hydrating Toner) with a cotton pad in the morning as a cleanser in lieu of soap. In the evening, after cleansing, blend with a facial oil or serum, or apply directly onto the skin and follow with a facial oil or serum. 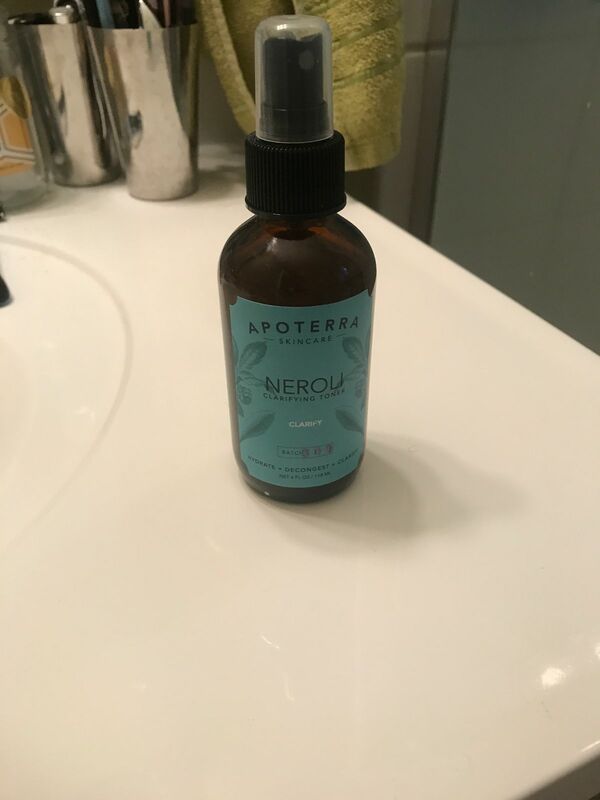 Another great product from Apoterra. I've been using toner for years, but this one just feels different. It is very refreshing and lightweight. Combined with the soap and serum, it works wonders. As stated in some of my other reviews, this combination has helped tremendously with my breakouts, and in turn, my overall confidence. These products are amazing, last a long time, and are unbelievably affordable. Love this clean, natural beauty. Thank you Apoterra! I’ve been using this toner for the past few months. At first I wasn’t too crazy about the smell but its definitely grown on me. I only wish the bottle was a bit bigger for the price - otherwise I love it! This toner, though more than I thought I would ever spend on a toner, is truly worth every penny. If I could, I would bathe in it. I have combo/dry/acne prone skin. After stumbling upon Apoterra I emailed them with some information about my particular skin situation and they were SO helpful and kind! They recommend the Nourish Kit, which I've been using for about a month. I love it all, but this toner is the star of the show! It is jam packed with nutrients and the smell is fantastic. So calming. Like a mini spa in every spritz. I still have some break outs in my "tough spots" (around my jaw and the sides of my chin), but it is a huge improvement and continuing to improve! My face seems to be glowing every morning and I've been feeling confident enough to skip the makeup, even to work! Already seeing an improvement in quality of my skin. I have combination sensitive skin with some oily spots and breakouts around my cycle and this product keeps my skin really clear. I love this product so much, whenever I run out of it my skin becomes dry and tired. It brings moisture and radiance to my skin, I can tell the difference after only a few days using it.